HOTERY PRODUCTS CORP. provides a wide-range professional technology focusing on Oxy Torch manufacture, supply and development. Our experience in design and produce enable us to offer products for any application. Also we can modify any existing standard design to accommodate your needs. We are a high-tech company in this field which is capable of designing, producing a series of high quality products. We have been established stable and reliable cooperative relations with customers all over the world. Welcome to join the wide and favorable cooperation with us now! Ideal for construction, crafts, metal sculpture, glass blowing, and electronics repair and manufacturing. It can weld an unlimited range of materials. This torch is easily maneuvered in areas impossible to reach with conventional torches. 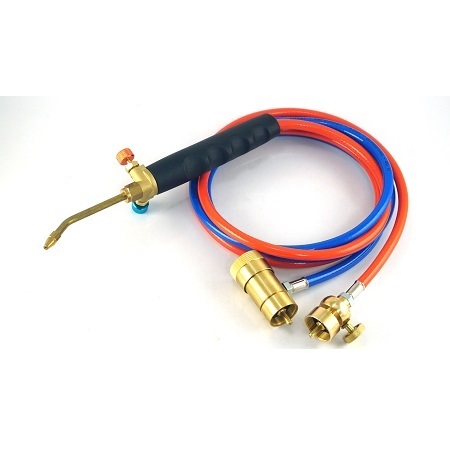 Used simultaneously with an Oxygen cylinder and MAP-Pro™ or Propane cylinder. Using an Oxygen cylinder will result in the torch flame burning at a much higher temperature than normally would occur. Preassembled pressure gauge for making good control of gas output. Gauges will save gas fuel whilst optimize the flame performance get a brighter, straight and tighter flame.